From the pictures of the Skye, one immediately thinks of this small-size white balloon, the sort that we sometimes find in officials ceremonies in China. In fact, it is a blimp of 2.65m diameter driven by 4 propellers, which can hover as high as 30 meters in the air. 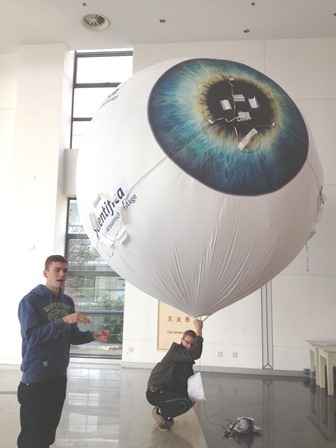 This cool project is brought over to Tongji University in Shanghai by a group of 10 Swiss students from the Mechanical Engineering Department of ETH Zurich. Skye is a novelty which combines the elegant and energy efficient flight of blimp with the precise handling characteristics of a quadrocopter. Its symmetrical mechanical design allows orientation in any direction. With its integrated camera system, it can take in scenes from mid-air for a very long flight duration. The four motor platforms aligned tetrahedrally on the surface of a spherical hall. Each platform contains a rotor that may be turned in any direction tangential to the hull’s surface. The ability to hover midair is provided by helium – the propellers are used for movement and stabilization against wind. An intuitive 3D mouse makes it possible to transmit any movement by the pilot directly to the system. As an alternative, it’s possible to control Skye by a touchscreen, where waypoints may be set on a map. Project Skye is jointly supported by the Autonomous Systems Lab at ETH Zurich and Disney Research Zurich. Among all the places in the world, why do these students come to China? Naturally, it’s a great trans-cultural experience for Swiss students to work with Chinese professors and students. More importantly, they need to find out whether it can be produced faster with lower cost. With the help of Chinese professors and students, the students are also working hard to minimize the propeller in China, redesign the electronic system, and find modularity for different events. On 17th December the two teams of Tongji University and ETH Zurich presented SKYE two, the improved version of the first project. From September 2012 until December 2012, 10 students from the ETH Zurich have been collaborating with 10 students from Tongji University on this project in Shanghai. The main goal was to create a more efficient and overall less cost intensive version of the first SKYE. During the three months of intensive collaborative work, the team successfully reached all their goals: First of all SKYE two can be transported in 2 boxes and be set up by only one person alone. Secondly the propellers are smaller, but more powerful and therefore safer than in the prior version. Last but not least it became cheaper to produce all parts: only 12'000 USD. For the two student groups it was overall a great experience. The Chinese explicitly mentioned the Swiss problem solving skills and enjoyed the communication skills of their Swiss colleagues. In return the Swiss students really appreciated the Chinese production process and in general the exposure to the Chinese culture. In the future more projects will follow in cooperation between ETH Zurich and Tongji University.